'Greg Arious and the Lexicons' is a story that was designed to help teach KS2 children all about synonyms and how to use a thesaurus. 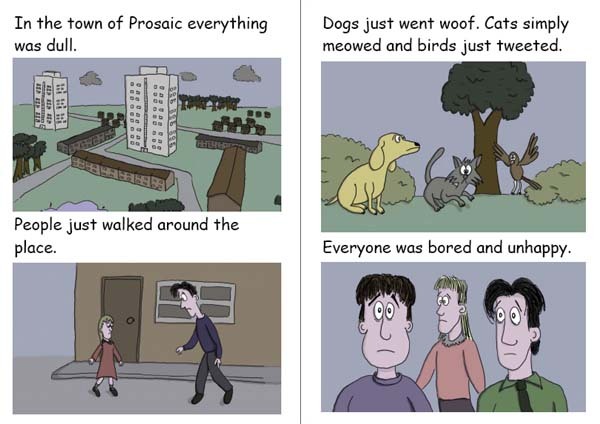 It started out life as a very basic, crude text but has recently been redrawn, coloured and updated and is now available with a complete teacher's pack that uses the text to teach several aspects of the Literacy Strategy, not just synonyms. The new pack is available from our commercial sister site Primary Extra and sales of the resource helps fund our work on the main free Primary Resources site. The book tells the story of a dull, boring town that is completely transformed when a group of aliens arrive bringing with them a box full of magical words. The new version of the story comes in a teacher's pack with printable color and black & white versions of the book, a computer presentation of the story (for use on an interactive whiteboard), a teacher's guide and a collection of activity sheets. Sarah Cooling writes: "I thought you would be interested in the lessons I used based upon your synonyms book "Greg Arious and the Lexicons". Having covered work on Thesauruses and Synonyms in class:- Year 3 Term 1 (second half) I found your book to be of great help! Having printed it off I enlarged it to A3 and left the beginning of the book in black and white. It was only when the spaceship appeared that I coloured this in. 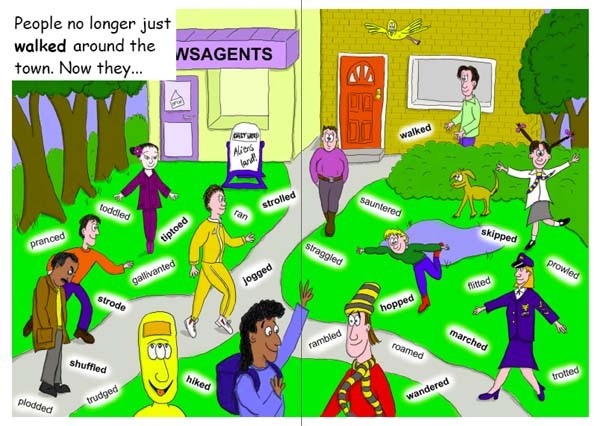 I also coloured the aliens in and then the rest of the town once the synonyms appeared in the story to highlight the benefit of synonyms. In shared reading I covered up a word and asked for other synonyms using thesauruses to help familiarise themselves with the lay out. The class loved the story and were enthralled throughout the week with this. Since then we are looking at newspaper reports and writing up our article based on Greg coming to Earth! I thought you might be interested how it worked in class." Ann Rose writes: "Just thought I would give you some feedback on using Greg Arious and the Lexicons in the class room. I have been using it with my lower ability year 3's this week for thesaurus work and they have LOVED it. We used it to spark a drama session on Monday, where they had to act out all the walking words and do all the animal sounds, they really enjoyed it and have retained the information all week. I have also blown the word pages up to A3, and the kids are going to colour them. I'm laminating them and putting them on display with a whiteboard pen, so when the kids use the words in their writing they can highlight them on the wall. The children were really hooked on the story, but wanted the screens on the Lexicons heads to play Yu-Gi-Oh cartoons - ah, todays youth, it was Teenage Mutant Hero Turtles in my day! Thanks for this excellent resource and a fantastic website."